Note 1: Like Final Fight games? Check out my reviews of Final Fight Guy and Final Fight 2! Also, check out my other other Beat ‘Em Up reviews of Sengoku 3, Double Dragon II, Warriors of Fate, Nekketsu Oyako, Crows: The Battle Action, D & D, and Bare Knuckle III! Note 2: This game was played on a NES 101 (top loader) console that has been modified to output in AV (red, yellow, white), just like the original NES. The NES was connected to a 32-inch HD tv. The NES 101 is much more reliable than the original model. Fight through 5 rounds of Beat ‘Em Up mayhem. Quick History: Mighty Final Fight was released in 1993. 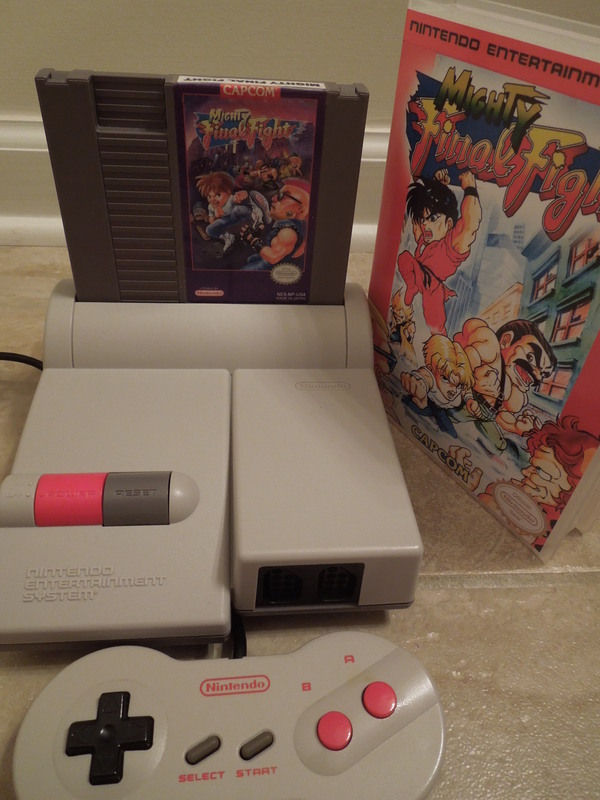 With the Nintendo Entertainment System’s big brother, the SNES, having been released 2 years earlier, the 8-bit NES was in its twilight by the time that Mighty Final Fight hit the market, with fewer and fewer games being released for the console. Because of the SNES’ popularity, many gamers no longer purchased NES games, opting for the better graphics, sound, and overall ‘newness’ of the powerful 16-bit Super Nintendo. So, unfortunately, great games like Mighty Final Fight went unnoticed by many gamers. Had the game been released during the NES’ prime, it likely would be extremely well known, and may even have reached ‘classic’ status by this point in time. Story: This game is essentially a parody of the arcade game, Final Fight, released for the arcades in 1989 and for the SNES in 1991. 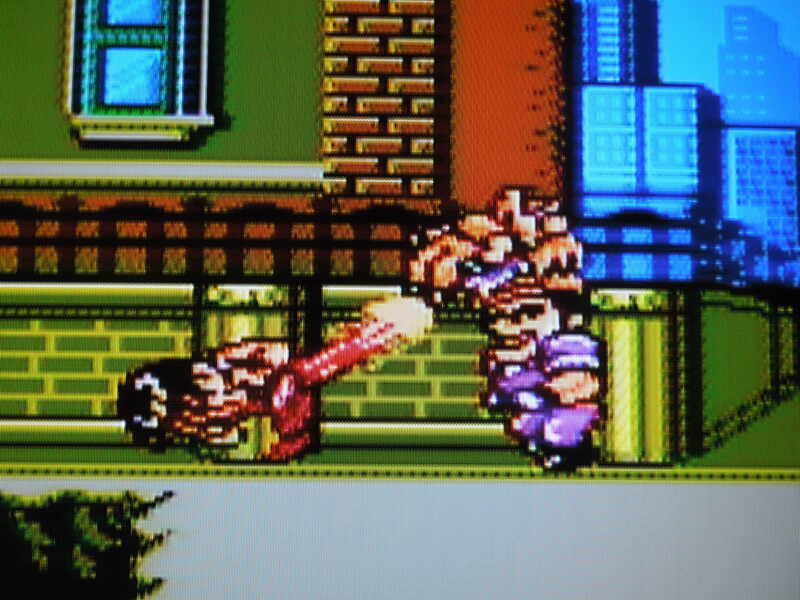 In Final Fight, a vicious gang, led by a man named Belger, kidnaps the mayor’s daughter, Jessica, and you must fight to rescue her. 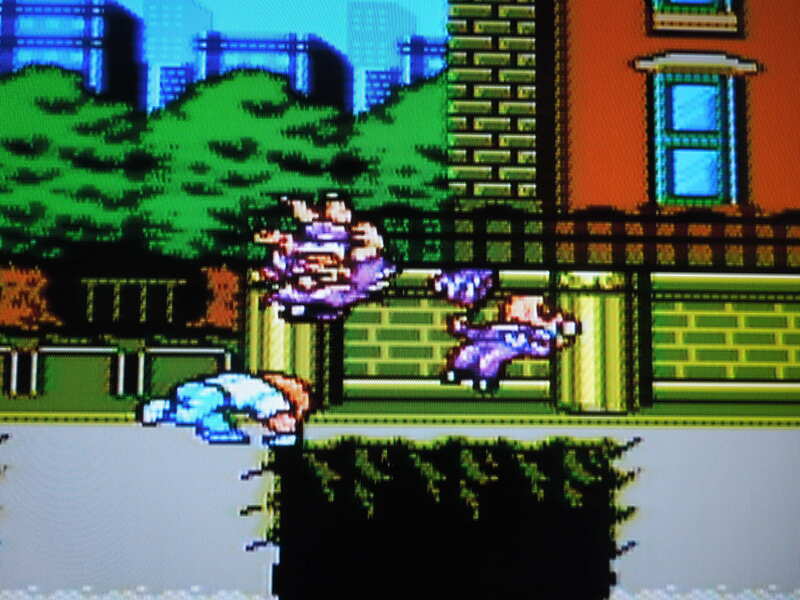 There is an implication in the arcade version, and somewhat in the SNES version, that Jessica’s virtue is in very serious danger at the hands of the gang members. 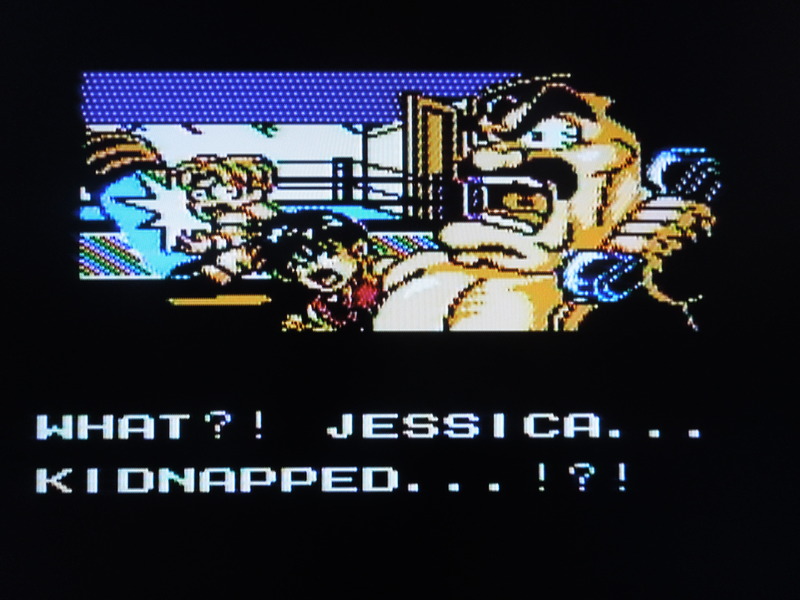 In Mighty Final Fight, however, Jessica has been kidnapped in order for Belger to marry her. The entire story is presented in a much more light-hearted style with comical tones, much different from its arcade counterpart. Mayor Haggar, Jessica’s boyfriend Cody, and his ninja friend Guy must thwart the gang and rescue Jessica. Throwing enemies into other enemies? Check. Gameplay: This game is, of course, a Beat ‘Em Up. Much like Final Fight, in Mighty Final Fight, you must brawl your way through hordes of Mad Gear gang members in order to rescue Jessica. 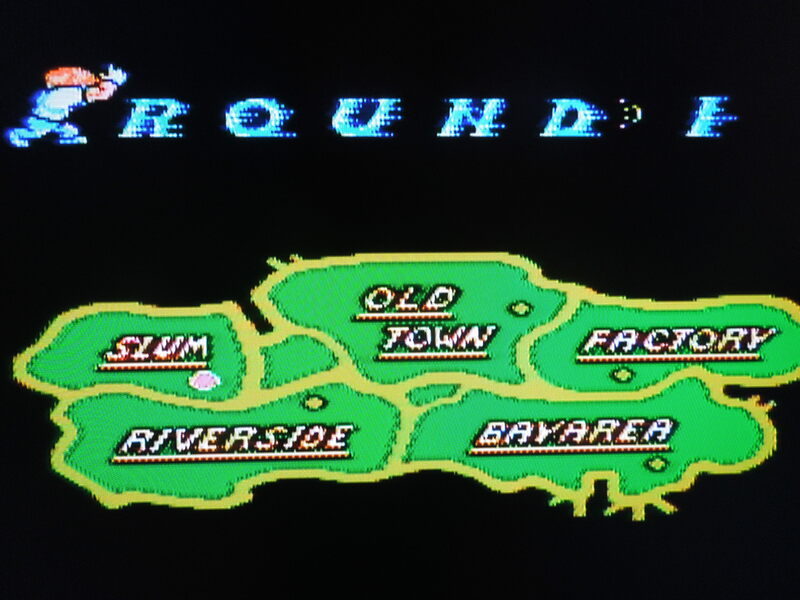 There are 5 Rounds in the game, each made up of a couple of different areas – these range from the streets, to a riverside area, to a factory. At the end of each round, you fight a boss. You select 1 of 3 characters: Haggar, Guy, or Cody. 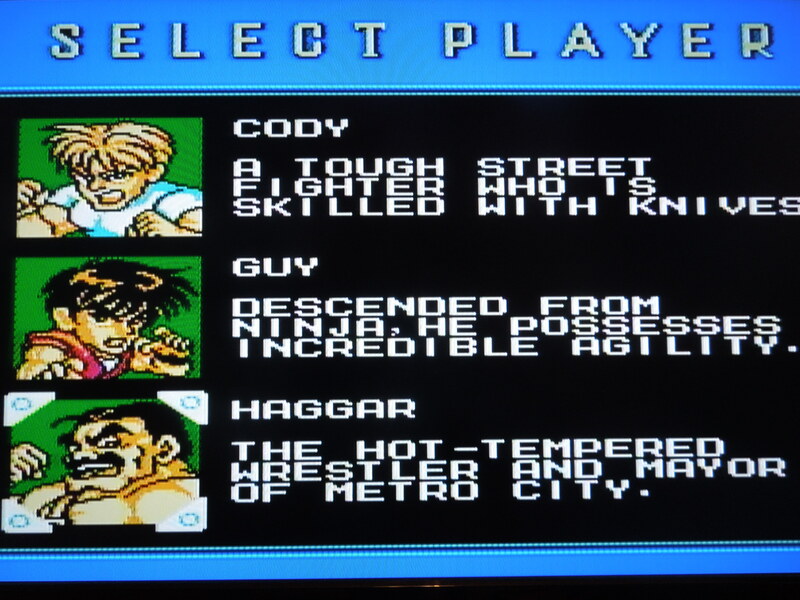 Haggar is slow but strong, Cody is well-rounded with average strength and average speed, and Guy is the quickest and weakest. Much like the SNES version of Final Fight, this game is for 1 player only. However, the fact that you could choose among 3 characters instead of 2 did give this game an advantage over the SNES game. Mighty Final Fight added a unique ‘level up’ system to this game, however, that makes it a little more than your standard Beat ‘Em Up. During gameplay, your character gains experience points after defeating enemies, and he will ‘advance’ levels after a set number of points has been gained – your life bar gets longer with each level gained, in addition to being re-filled. Your character has 6 total levels he can advance to throughout the game. Cody and Guy start the game at Level 1, but Haggar starts at Level 3. At level 4, your chosen character will be able to execute a Super Attack for the rest of the game. You can advance your character’s level faster by using different moves as the ‘kill move’ on an enemy. For example, a regular punch kill will earn you 2 points, but a throw kill will earn you 4. It’s fun to see play around with, but there are also detailed FAQs online about this Level Up system. Also, there are never more than 2 enemies on screen at one time, but new ones come quickly as you make kills. 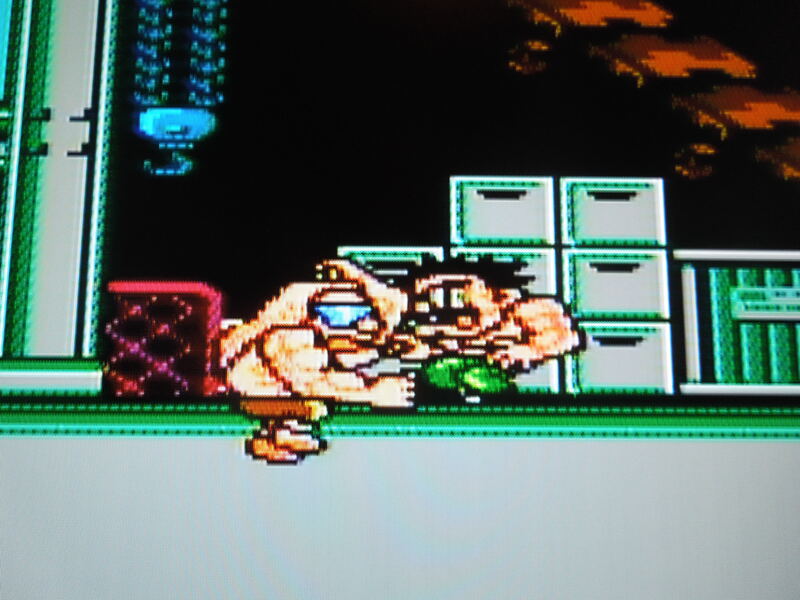 Damnd (in this pic), Sodom, Abigail, and Belger are the game’s bosses, like in the original arcade Final Fight. Guy’s Super Attack is a lightning-fast Super Kick. Controls: B punches (tapping rapidly executes a combo). A jumps. Jumping + pressing B executes a jump kick (Guy and Cody) or cannon ball (Haggar). Jumping + down + B executes a knee drop for Cody and Guy. Hitting A + B executes your Special Move, which clears out all enemies around you, but costs you a bit of health. Getting in close causes you to automatically grab an enemy. Simply pressing B when you grab an enemy will cause your character to knee smash (Guy and Cody) or headbutt (Haggar) them. Pressing B + right or left when an enemy is grabbed will cause you to throw the enemy (Guy and Cody) or suplex them (Haggar). Additionally, with Haggar, you can jump with a grabbed enemy in hand and press B while in the air to pile drive him or her. Once you’ve reached your character’s Level 4, execute your character’s Super Attack by pressing B followed immediately by left or right on the control pad. Cody throws a fireball, Guy lets loose a lightning super kick, and Haggar will race toward an enemy and grab them for a suplex or pile driver. Earn 1-UPs and 2-UPs in bonus rounds. Sound and Music: For comparison’s sake, this music is more catchy than what’s found in the SNES’ Final Fight. The sound effects are all well done – it sounds like you’re really getting into it (for a video game) with these street toughs. Health items: As you fight your way through the game’s 5 rounds, you’ll encounter barrels to break open. Sometimes food will pop out – food replenishes your life bar, or, if your life bar is already full, will add to your experience points total, helping your character ‘level up’ faster. Other Items: During bonus rounds, in which you must break rolling barrels, you can earn hearts (1ups) or dolls (2ups). Also, money bags can be found that grant an extra continue. Weapons: Weapons can be found in barrels, and they are unique to which character you’ve chosen – Haggar gets a huge mallet, Guy gets throwing stars, and Cody gets a knife. Roxy and Poison are in this game? I thought Nintendo didn’t want any controversy over ‘violence against women.’ Yep, they’re here. Although the enemies don’t have names like in the SNES’ Final Fight, these two female gang members are definitely in the game. In 1991, when Final Fight was released for the SNES, Nintendo censored the game by removing Roxy and Poison and replacing them with male gang members named Billy and Sid (in the North American region). However, I guess when Mighty Final Fight was released 2 years later for the NES, Nintendo of America decided it didn’t matter anymore, and included females. Interesting. Mighty Final Fight’s story is much more comical in nature than the arcade Final Fight. So, where can I find this game? Ebay, Amazon probably. It was also made available for the Capcom Classics Mini-Mix for the Game Boy Advance handheld system. You can play the rom on a computer emulator as well. Conclusion: This is one heck of a Beat ‘Em Up. The characters are big and detailed, and they’re drawn in that ‘super-deformed’ art style, which, personally, I’ve always thought works well in these type of games. There is some very slight flicker, occasionally, with bigger enemies on screen. The control, music, and sound are all great. The addition of the ‘leveling up’ system is a nice touch, yet doesn’t detract from the simplicity of the game. Is it repetitive? Of course, and that’s what makes Beat ‘Em Ups so great! Being able to choose among all 3 characters is great, instead of only 2 like in the SNES game. You can change characters if you have to continue. 2 player co-op would have been a wonderful addition, but it’s sadly absent. 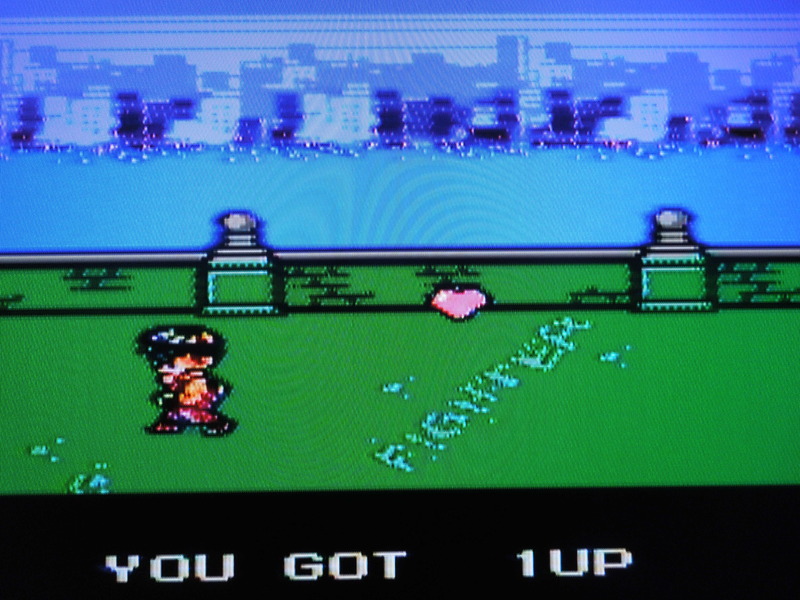 I’m not sure of another game quite like this one for the NES – perhaps River City Ransom is closest, but even that is a stretch. 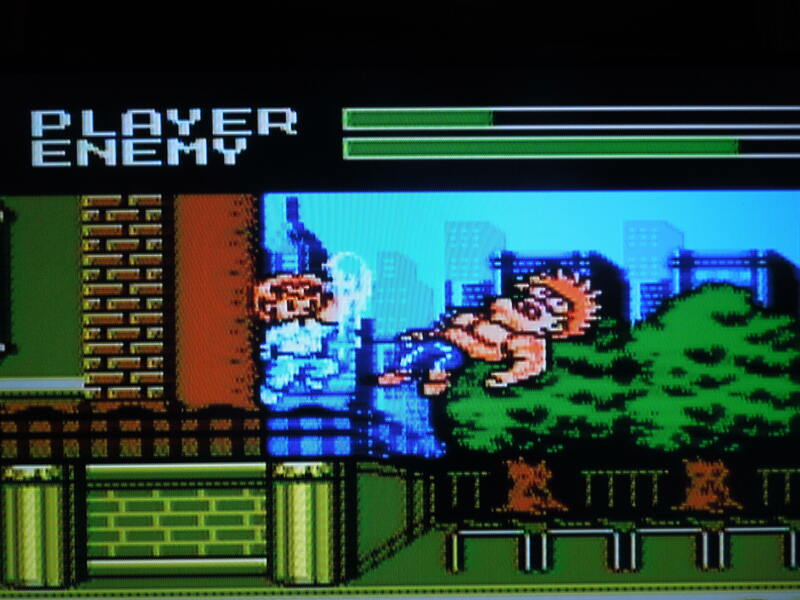 Is this game better than the SNES’ Final Fight or the lesser-known alternate version Final Fight Guy? Yes, it is. And that’s saying something, because those games are terrific. Some of Cody’s moves have been borrowed from Street Fighter II. This entry was posted in NES - Mighty Final Fight and tagged Mighty Final Fight Review (NES). Bookmark the permalink.